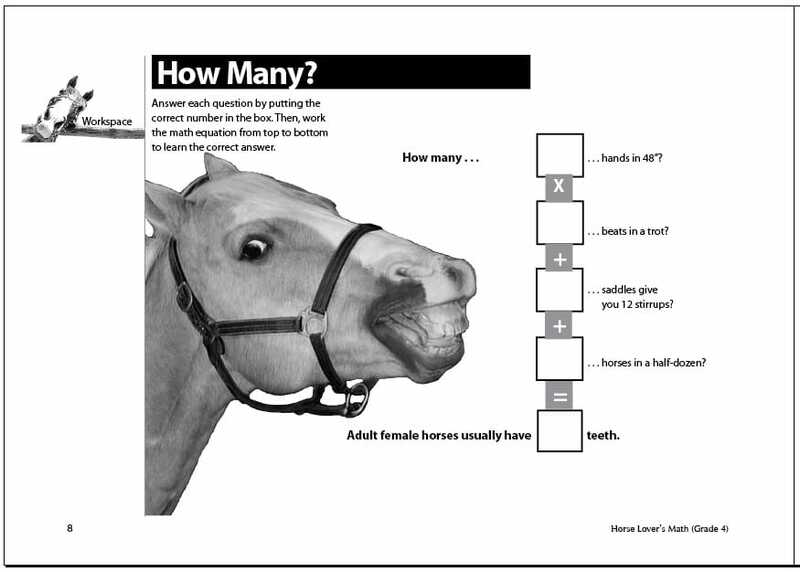 Horse Lover’s Math will be publishing three informative and fun math workbooks. 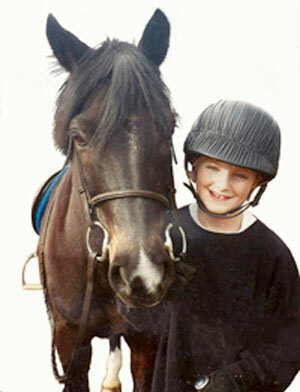 The horse information in these workbooks is of interest to all horse lovers, no matter what their age. The math concepts in the workbooks will be targeted to meet curriculum guidelines for grades 4, 5, and 6 and will be available in both Canadian/metric and Imperial versions. The Level 1 workbook follows grade 4-5 math curriculum guidelines, the Level 2 workbook grade 5, and the Level 3 workbook grade 6. Everyone masters math concepts at different rates. 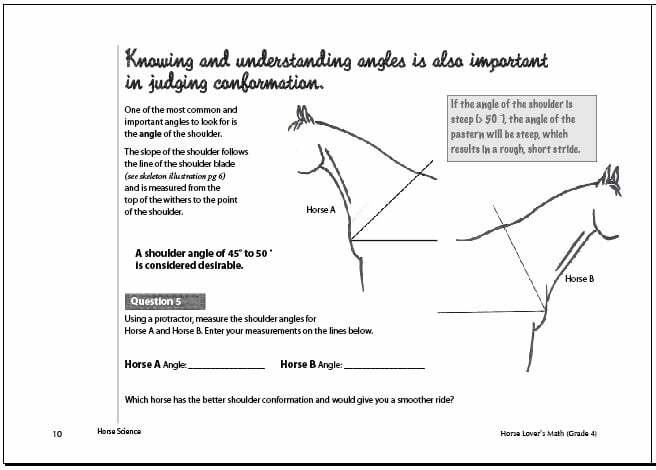 Regardless what grade you’re in, the workbooks will expand your knowledge about these beautiful animals and demonstrate the role and importance math plays in the real-world of horses. 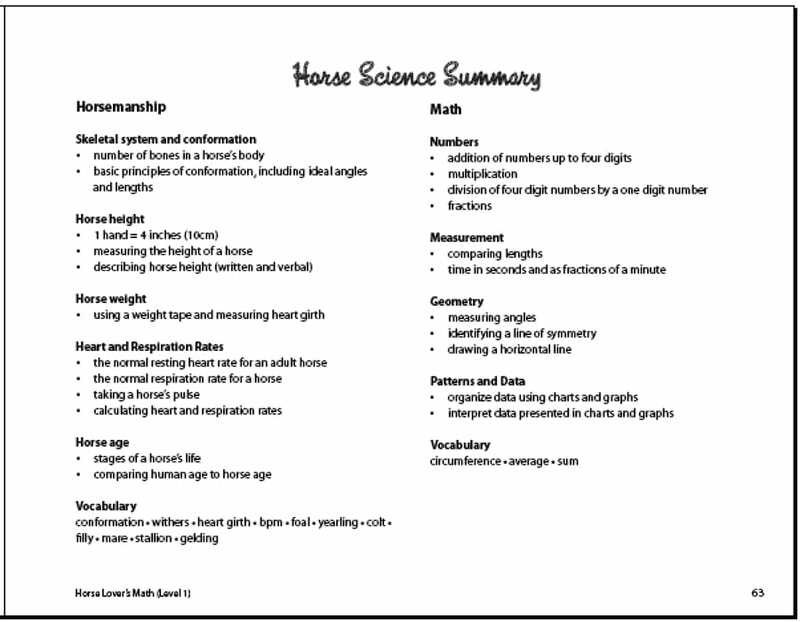 Information about various equine subjects builds from one workbook to the next. 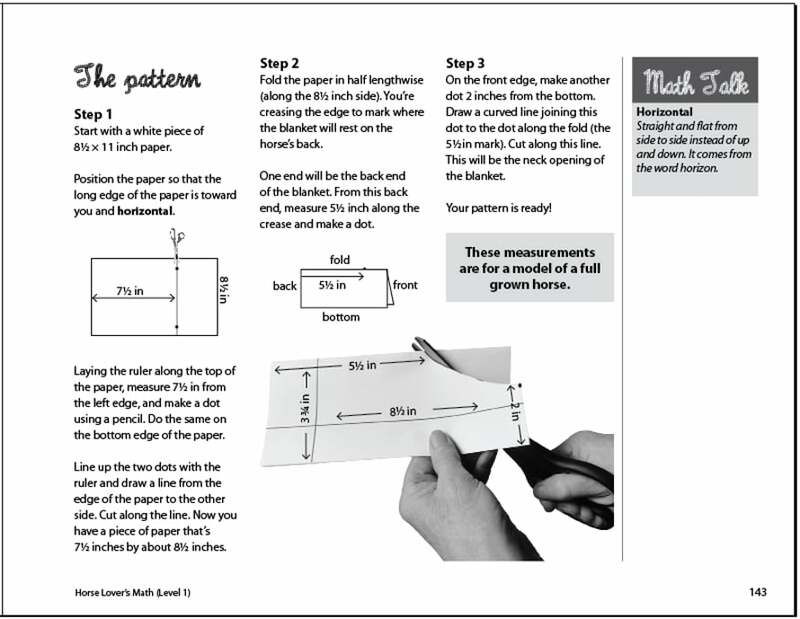 The Level 1 workbook teaches how to estimate a horse’s weight using a weight tape; the Level 2 workbook will introduce an alternative method: calculating a horse’s weight using a mathematical formula. The Level 2 workbook is currently in production. As each chapter is complete it will be available for download in HLM’s store. Once the entire book is finished it will be made available in both print and as a pdf download. Please note: Currently, only the Level 1 workbook is complete. 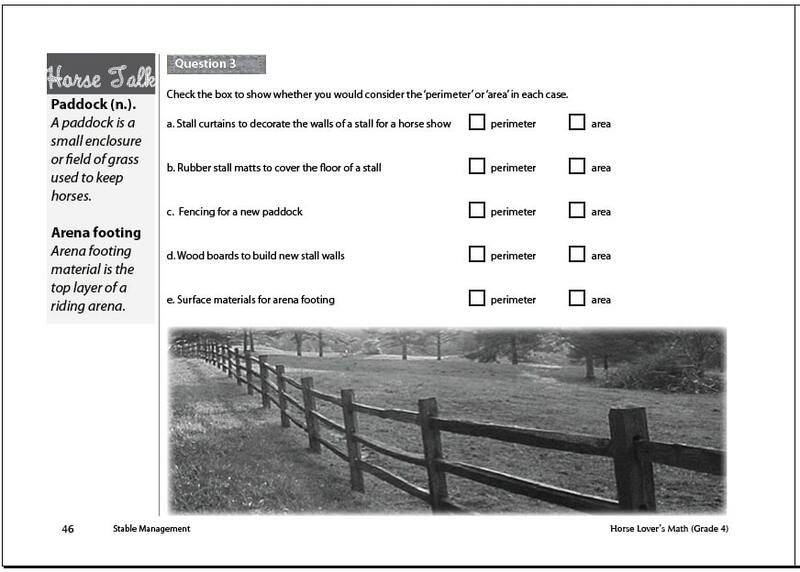 The first six sections of the Level 2 workbook are available for download in HLM’s store. Just one more to go! As each section is complete it will be made available until the entire book is finished. At that point a print version will also become available. Work on the Level 3 workbook will commence once the Level 2 is complete. Each book will be over 160 pages with content covering every aspect of the horse world. 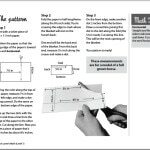 The books will be spiral bound for easy use when making calculations, measuring angles and following instructions in the Things to Make and Do section. Illustrations and photographs will enhance the learning experience as well as add to the beauty and interest of each page. 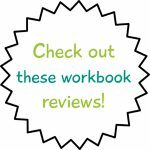 Click here to read Cathy Duffy’s review of the Level 1 workbook. Haynet is the UK’s #1 equine social blogging network. Check out what they had to say about the Level 1 workbook. HorseTalk NZ reviewed the Level 1 workbook. Read their review here. The Level 1 workbook received a great review from The Old Schoolhouse Family Education Magazine! My daughter loves horses, but not math (imagine that!) and I have long been searching for ways to make math more meaningful and enjoyable for her. I am pleased to say that I finally found what I was looking for in Horse Lover’s Math. The real-life horse facts and problems bring math to life in a meaningful context for all horse-lovers. Much to my delight, after years of cajoling my daughter to complete her daily math activities, I have, on more than one occasion, observed her picking up the workbook and working on it all on her own! 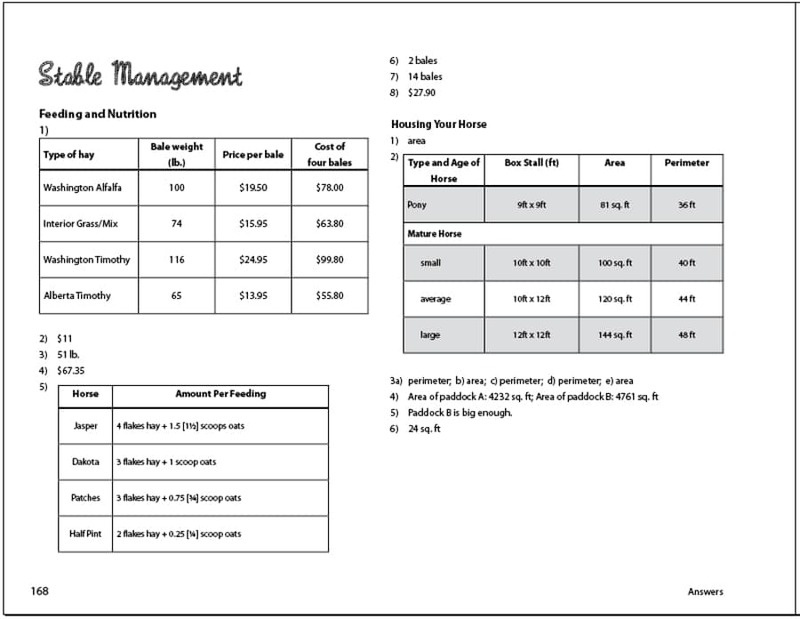 Level 1 Workbook: 175 pages of math as its used in the real-world of horses. Just $28 print, $12.99 download! Buy Now! 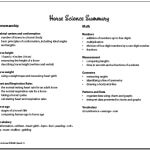 In Horse Science, children will learn how to calculate the height and weight of a horse and read their vital signs as well as learn information about conformation, age and horses. Math knowledge required in this section includes measurement of length and angles, addition, multiplication, division and fractions. 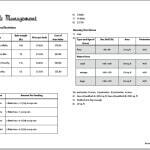 Bar and line graphs and tally charts are used in presenting the material. In the Stable Management section they’ll learn about different types of feed, how much to feed and how much feeding a horse costs. Keeping horses safely requires knowing how much room they require, both in the barn and out in the field. When caring for a horse it helps to keep the horse’s records using a calendar; when should the farrier come, when is the next worming due, when is that first schooling show of the season? 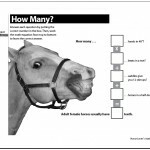 All this is important information and necessary in keeping a horse healthy, and all of it requires math. Horse Facts and Math Games will offer plenty of opportunities to practice math skills while learning cool stuff about horses. A Day in the Life will provide an opportunity to read and write time while following two friends participating in their first schooling show. Kids will also have the opportunity to see what it is like to go to a horseback riding summer camp. Fractions, measurement, multiplication are all going to be required in the Things to Make and Do section. There will be recipes for horse treats, instructions for making a haynet out of bailing twine, directions for making a horse height measuring stick and more. 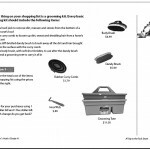 A Summary page is included at the end of each section. 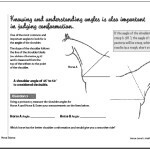 The page describes the ‘Horsemanship’ component of the section as well the the ‘Math’ used in the section. 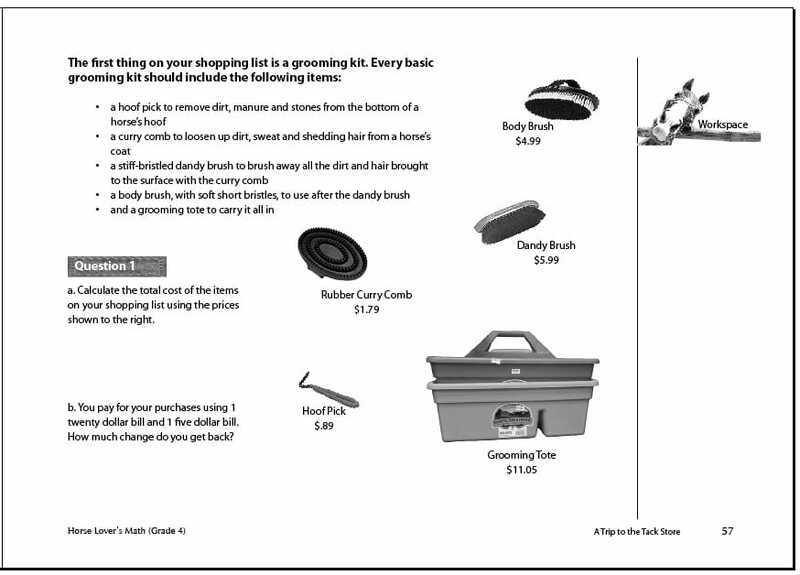 In the section A Trip to the Tack Store, children will learn about halters, curry combs and lead ropes, how much they really cost and how to add, subtract and multiply those costs. Various Sports will be covered. There is a great deal of math involved in show jumping, both in the riding of courses and in their design. Math also plays a part in how these competitions are judged. How many points are awarded for a knockdown or refusal? What happens if the ride is finished past the time allowed? They’ll learn the point system, judge an imagined competition and add the points up. Barrel racing is a timed event with exact pattern specifications for the course that involve measurement and distance. Interesting information, fun sports – and lots of math. Kid’s can check their own answers at the back of the book in the Answers section. 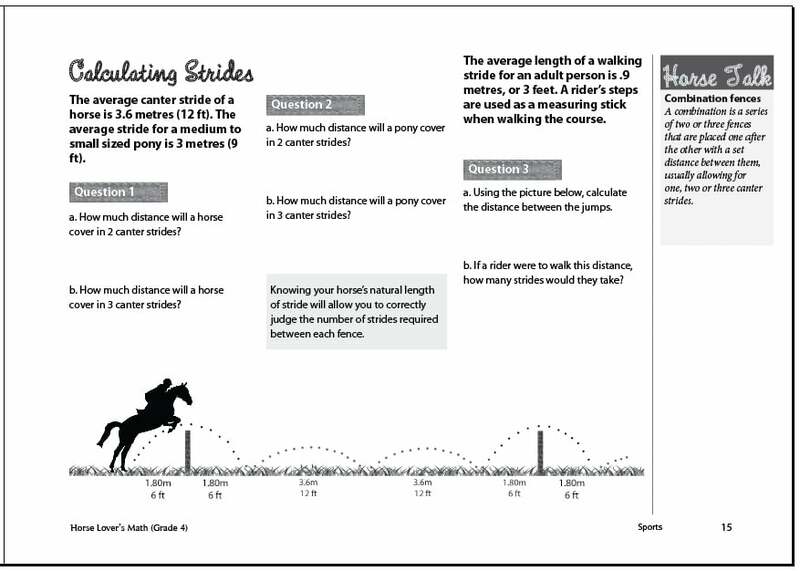 Aligned to the Common Core Standards Initiative, Horse Lover’s Math presents children with real-life pre-Algebra, geometry, and other math concepts. This real-world scenario approach promotes an improved learning experience that fosters a sustainable understanding of math concepts. 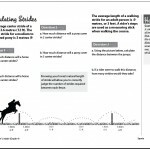 Horse Lover’s Math can be used as a supplemental math curriculum for 4th, 5th, 6th grade classrooms, individual use, or as part of a homeschool math curriculum.